Several volunteers with the Good News firewood ministry stand with several loads of split and ready firewood, some of which has already been donated to homes in need. 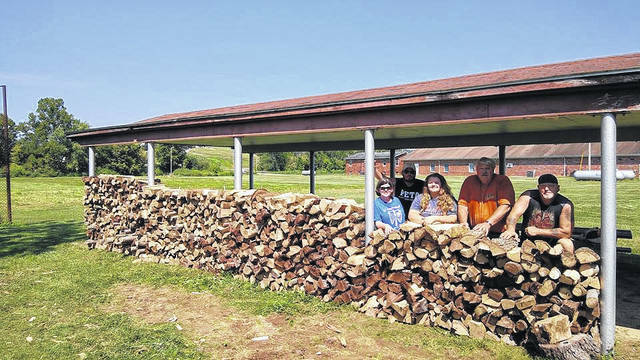 GALLIA COUNTY — Good News Baptist Church has been doing a new outreach ministry this year, collecting firewood and processing it to give away to families in need. What began as an idea for men in the church to fellowship together grew into a way to help families in the area. The church gathers wood that is donated from individuals that need trees removed but cannot afford to pay for their removal, or are simply kind enough to support a ministry that helps others. Wood is collected from anywhere in Gallia, Meigs, or Mason Counties and the church will donate the wood to anyone in the tri-county area. The Deacons at GNBC are tasked with caring for the physical needs of the members of the church and others, and they have taken these resources to help warm the homes of families that are facing financial burdens during the winter time. While many homes in the area have moved away from heating with firewood, there are still plenty that heat with wood; as it is a common and often cheap source of heat. “Knowing it’s for a good cause makes it not seem like work. And spending the day with the people from church is always a fun time,” said Ginger Denny, who attends Good News and helped with gathering firewood. Her daughter Grace Denny also helped out. “Chainsaws are fun, but so is helping people. I really enjoy helping others through church,” said Grace. “I have fun ‘fellowshipping’ while working to provide for others,” said Mariah Liberatore; a youth member at the church. Many members of the church and their families helped out by carrying and stacking firewood, while others still helped out by cutting and splitting trees that were harvested. If anyone in the tri-county area would like to inquire about firewood, call Good News Baptist Church at 740-446-0188.